Framed filters are sold in boxes of 15. 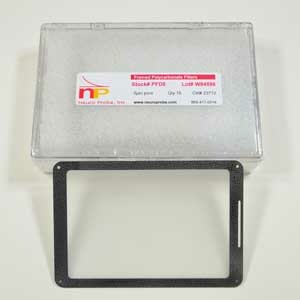 Polycarbonate track-etch (PCTE) membranes are the primary type of filters used in our chambers and instrument systems. This is a very thin membrane ranging between 6-10µm in nominal thickness. This membrane type offers excellent uniformity in pore size and density, as well as other benefits such as low extractables, low protein binding, and negligible absorption. 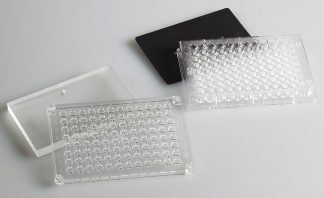 These characteristics make it ideally suited for use in chemotaxis assays as well as other high purity screening assays. 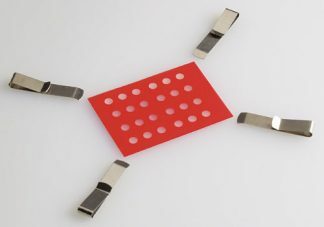 To provide a filter suited to 96-well applications, Neuro Probe developed the framed filter, in which filter membrane is bonded to a rigid frame that enables the user to hold the filter by the frame during laboratory procedures. PVP Treatment –PCTE membranes are available pre-treated with the wetting agent polyvinylpyrrolidone (PVP) which makes the surface hydrophilic. PVP-treated membranes are used when the media solutions cannot wet out the membrane by themselves. This occurs primarily when working with very small pore sizes or high viscosity media solutions. Certain cell types such as neutrophils do not adhere well to PVP treated membranes and tend to drop off after migrating. 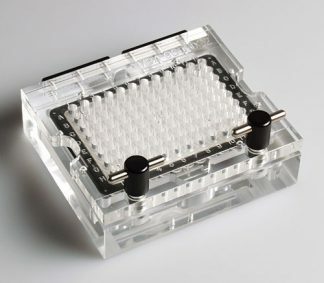 While this is problematic when quantifying cells on the filter, some researchers using the ChemoTx® sytem or the MB-series 96-well chambers and quantifying in the plate find this to be an advantage. Extra-cellular matrix proteins do not adhere well to PVP treated membranes either. If your assay requires such coating, we recommend using PVP-free membranes. Many factors other than cell type enter into the pore size selection process. Please see our page on Experiment Design.